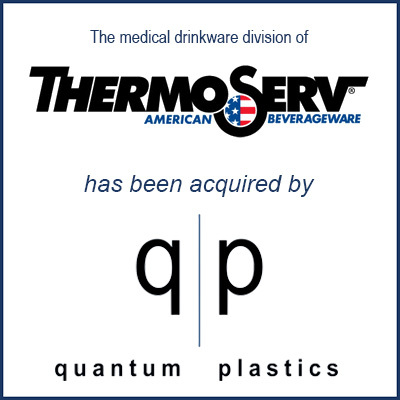 Elgin, Illinois – October 2017 – Quantum Plastics has announced that it has acquired the medical drinkware product line of Thermoserv. Based in Dallas, TX, Thermoserv is a leading manufacturer of innovative drinkware and tableware. The acquisition includes certain proprietary molds, molding machines, auxiliary and secondary equipment, as well as a viable book of business with several top-tier customers in the medical device industry. The business will be transitioned from Thermoserv’s headquarters in Dallas to Quantum’s molding plant in Fort Smith, AR. The deal helps Quantum Plastics expand in the medical industry and also gives it a proprietary line of drinkware products. From Thermoserv’s perspective, the sale provides capital and frees up floor space in its factory, which will allow Thermoserv to pursue growth opportunities closer to its core business in drinkware and tableware. “Quantum Plastics will continue to grow through both organic growth and M&A. We are excited to market this propriety drinkware through our Hospitec division. As with our previous acquisitions, we anticipate this new line to ensure our growing company a stronger foothold in the plastics industry,” said Ron Embree, President and CEO of Quantum Plastics. The acquisition marks the eighth M&A transaction completed in the plastic molding industry for Quantum Plastics, which purchased Master Molded Products in 2014. It followed this initial deal with acquisitions of River Bend Industries, Apollo Plastics and Hospitec USA in 2015. Quantum added 3D Plastics and Plasticos Promex USA in 2016. Quantum Plastics was established in 2014 and now offers over 300 molding machines ranging in size from 8 to 3,000 tons and a multitude of capabilities including custom injection molding, blow molding, insert molding, gas assist molding, decorating, assembly and other value-added services. Quantum Plastics operates with the objective of being a world-class plastics company centered in the idea of offering a variety of processes within multiple product segments with a growing footprint. The fundamental vision to be the undisputed leader in engineering and quality is the driving force behind Quantum Plastics. Visit www.quantumplastics.com to learn more. Thermoserv is a leading manufacturer and provider of innovative drinkware and tableware products that are Made in America and designed to fit every lifestyle. Thermoserv supports businesses in the retail, food service, specialty advertising and healthcare markets. For more information, visit www.thermoserv.com. Molding Business Services of Florence, MA (MBS) advised Thermoserv in connection with the deal, which became the 88th successful M&A transaction for MBS in the injection molding and engineered components space. Plastics News also wrote an article on this transaction. Click here to read.